Welcome to Rose Ministries. While we use PayPal for payment processing, which is trusted by over 203 million consumers, you do NOT need a PayPal account to checkout. You can use your preferred payment method without a PayPal account. 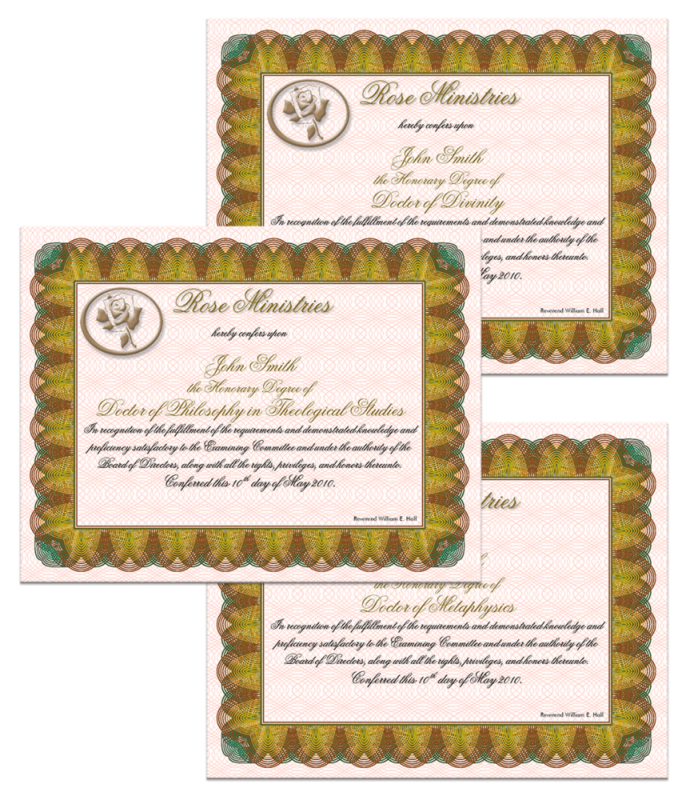 These non-accredited honorary degrees can elevate your professional stature by showing your leadership status within your church and enhance your standing as a legally ordained minister. These are only granted to those being ordained or having been previously ordained by our ministry. Please upload your dissertation for review by the committee. Acceptable formats are documents (e.g., Word), plain text, Adobe PDF, or rich-text-format ("RTF"). If you have multiple files, they may be compressed using the ZIP format. Maximum file size is 3096k. © 2019 - Rose Ministries. All rights reserved.